Reddit’s users launched a new subreddit, Findbostonbombers, where hundreds of amateur sleuths are crowdsourcing clues and suspects in the Boston terrorist attack. In an inevitable development, Reddit users have begun crowdsourcing an investigation into the Boston terrorist attack. A new subreddit called Findbostonbombers had over 870 subscribers and 1,600 visitors on Tuesday, April 16 who were analyzing photos, parsing through video, and conducting third-party forensic analysis of the Boston Marathon attack independent of law enforcement. Commenters and contributors to the subreddit are posting a mixture of useful analysis, misguided amateurism, and racist or anti-gun activist invective. Many users on the site are focusing on a man they call ”Blue Robe Guy,” spotted in the crowd carrying a backpack identical to one of the black bags investigators say was used to hide one of the pressure cooker bombs. Both bags have identical shoulder stripe markings. Other users are organizing collections of mass photo dumps in order to sort through any photographs of the attack found for possible clues. While amateur sleuthing is fun, motivations behind the crowdsourcing can be questioned. As The Awl’s Choire Sicha noted, some of the posts in the subreddit are bigoted or simply bizarre. Reddit users looking for Islamist terrorists can, for instance, say “I hate to even bring up this point, but when I have seen videos of radical Islamists yelling ‘allahu akbar’ in the past, I seem to recall seeing them make something like the pinched thumb and forefingers gesture he is making in the second picture.” In addition, Reddit users are identifying potential suspects with potentially life-ruining consequences. There is always the risk of a crowdsourced Richard Jewell–that is, the risk of an innocent person being unfairly accused of a horrific terrorist attack by the subreddit in a meme that spreads across the Internet. The problem with doubting and sneering at the Reddit users cracking the case, however, is that crowdsourcing criminal investigations sometimes does work. In one noteworthy case, commenters on Gawker and New York‘s Daily Intelligencer succesfully identified Aidan Folan, a 21-year-old Brooklynite suspected of mugging and assaulting an elderly woman in a horrific subway station attack. Folan was subsequently charged with robbery and assault; the NYPD had failed to track Folan down in the three weeks following the mugging, but blog commenters identified and located him within minutes. In the meantime, even the FBI is embracing crowdsourcing of sorts: The law enforcement agency is requesting that anyone with photos or video of the Boston Marathon contact them. While crowdsourcing did crack the suspected Folan case, it’s important to note the magnitude of difference between the two crimes. The subway mugging was a horrific crime that, nonetheless, was a local news story and apparently not a priority for the NYPD. On the other hand, the Boston terrorist attack is an international news story that disrupted one of the world’s best known sporting events. It’s amazing how law enforcement resources can be reallocated when the case is big enough. Update: The FBI has identified the two suspects as Dzhokar and Tamerlan Tsarnaev, two Chechen brothers living in the Boston area. Reddit users apparently discovered the pair in numerous photographs on the /findbostonbombers subreddit. The suspects, identified by their distinctive hats, were flagged by Reddit users in threads such as Two Photos of White Hat after Forum Explosion and New picture of suspect 2. A data dump about Tamerlan Tsarnav, an amateur boxer, , says that the 26-year-old was the subject of a photography project several years ago and had a YouTube profile with a playlist dedicated to terrorism. Dzhokar is currently at large, and Tamerlan Tsarnaev died overnight in a confrontation with police. One of the biggest ramifications of the Reddit crowdsourcing effort, as I discussed earlier, was the incorrect identification of suspects. For all of the benign intent shown by (most) members of the Reddit community, they were still amateurs conducting a terrorism investigation in an extremely public forum. In a deleted thread on a non-terrorism investigation-related subreddit, users speculated that a missing Brown University student was a terror suspect. Someone, either trolling on Twitter or not understanding a police communication, said that student was named as the second bomber over a police scanner. That wasn’t the case. This student was named, and his family was harassed in short order. A family with a missing child was harassed by unknown internet users who thought they were doing good, all because of the crowdsourced investigation. Meanwhile, the million dollar question everyone is asking–but noone can answer at this junction–is how much actual law enforcement investigations leveraged from the crowdsourced Reddit and 4chan efforts. Were law enforcement officials scouring Reddit for leads, alternate approaches, or verification? We won’t know the answer for quite a while, but it’s hard to believe the FBI or Massachusetts State Police weren’t sneaking quick looks at either site. When the New York Post published a front page cover featuring two innocent men they implied were the Boston terrorists, it was a journalism fail. Although the Post said the photos were being distributed by “law enforcement authorities,” they were obtained through a distinctly 2013 brand of social and digital media. The photo was taken by Benjamin Levine, a 24-year-old Bostonian whose office at Marlo Marketing & Communications overlooked one of the bomb sites. 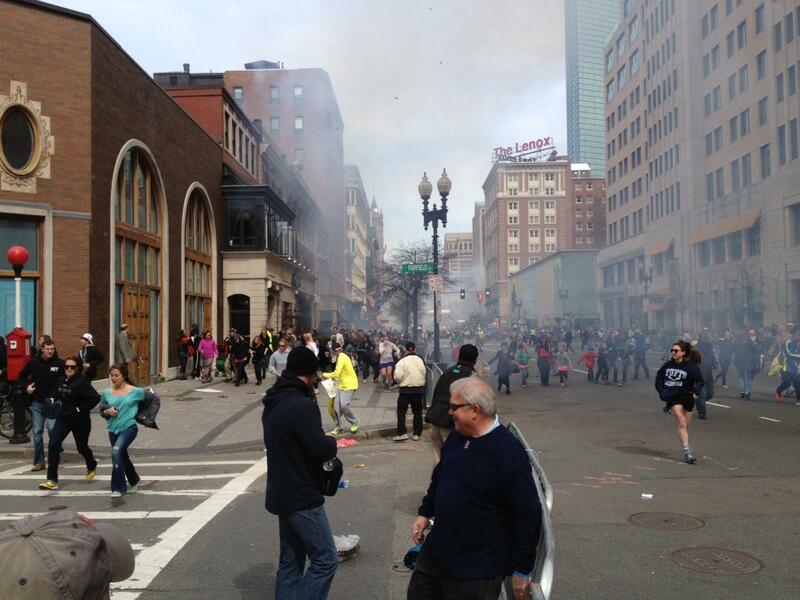 His firm was hosting a marathon party and he was taking photographs when the bomb went off. Levine sent several pictures to Deadspin and wrote a firsthand account after the terror attack; he told Fast Company that his firm encouraged employees to blog as a therapeutic exercise. Levine sent photographs to the Federal Bureau of Investigation shortly after law enforcement requested photos and videos from bystanders. Shortly after the photos went up on Deadspin, they became the subject of fevered speculation on Reddit and 4chan, which also hosted a crowdsourced crimesolving effort. Major newspapers then reached out to Levine asking for permission to republish his photograph. When Levine saw a cropped and enhanced version of his photograph on the cover of the Post, he was mortified. While Reddit’s thousands of amateur sleuths got a lot of things right, they also got a lot of things wrong. Earlier in this article, we referred to a “Blue Robe Guy” who Redditors speculated was connected to the terrorist attack. Like many other threads posted on the subreddit, the discussion of Blue Robe Guy was removed from the site. The subreddit’s creator, a 23-year-old professional poker player from England calling himself Oops777, told Buzzfeed’s John Herrman that the worst case scenario was “we waste our time,” but more than a dozen other potential suspects were flagged by Redditors. These posts were then taken offline in an attempt to eliminate confusion among users. With that said, Reddit users were crowdsourcing a violent attack and tentatively photo identifying suspected terrorists on a public forum accessible by anyone. As we all know, no one on the Internet ever jumps to conclusions or ever acts impulsively. The only problem is that Reddit users weren’t the only ones jumping the gun. Mainstream media institutions were just as bad; the New York Post famously put a picture on their front page of two men they implied were suspects; the two men were not suspects and just happened to be spectators of Middle Eastern descent. CNN mistakenly claimed a suspect was in custody when there wasn’t one. Sometimes established institutions jump to the same hasty conclusions as the crowdsourced mobs of the Internet. Inside Reddit’s user community, an enthusiastic amateur forensics subculture grew exponentially once the subreddit was formed. When Fast Company reported on the subreddit’s existence at the beginning of the week, it had approximately 870 subscribers; more than 9,000 Redddit users now patronize the site. The hunt for the Boston bombers on Reddit appears to have been the Internet’s largest crowdsourced crime-solving exercise to date–regardless of law enforcement’s feelings about it. Despite the presence of racist and anti-right wing trolls, Reddit users did find a number of important clues (and publicized a number of false leads to the detriments of others, but that is something we will return to in a bit). Sleuths on Reddit identified the hat worn by one of the bombers; the same thread also featured the highest resolution pictures of one of the bombing suspects to date–which was flagged by Reddit users as potential evidence. In a new indication of the meta atmosphere of reporting news in 2013, law enforcement authorities are asking Twitter users not to tweet any information about stakeouts, manhunts, or tactical operations being used to catch Tsarnaev. Law enforcement operations are currently in place in suburban Boston, one of the world’s most wired–and most social media-loving locales. Users on Reddit have discovered pictures that apparently show one of the suspects standing next to Jeff Bauman. Bauman was the Marathon bystander in an iconic photograph that showed him being wheeled away by Carlos Arredondo after losing both legs. Bauman is currently playing a critical role for law enforcement. Bloomberg reports that Bauman saw the bomber and spoke with authorities, giving critical clues as he was prepped for emergency surgery. The photographs on Reddit appear to clearly show both Tsarnaev and Bauman.